The weathered square-top white marble tablet in the photograph above is nothing special. This kind of marker is ubiquitous in American cemeteries. Not the kind of gravestone that draws attention because it is plain and not adorned with any remarkable features or ornamentation. But at closer inspection, this particular white marble tablet hints at a sad and poignant story—one that was all too common in the United States in the 1800s. It speaks to the danger of becoming a mother. According to the American Journal of Clinical Nutrition, Volume 72, Number 1, 241s-246s, July 2000, “There are few reliable data on maternal mortality rates in the United States before 1915, but thereafter, the United States had the highest rates of maternal mortality of any developed country.” One can assume that it wasn’t lower in the 1800s, at least, not substantially. According to that same article, a chart that maps out maternal deaths from 1900 to 1997, indicates that there were nearly 900 maternal deaths per 100,000 live births in the first year of the 20th Century. 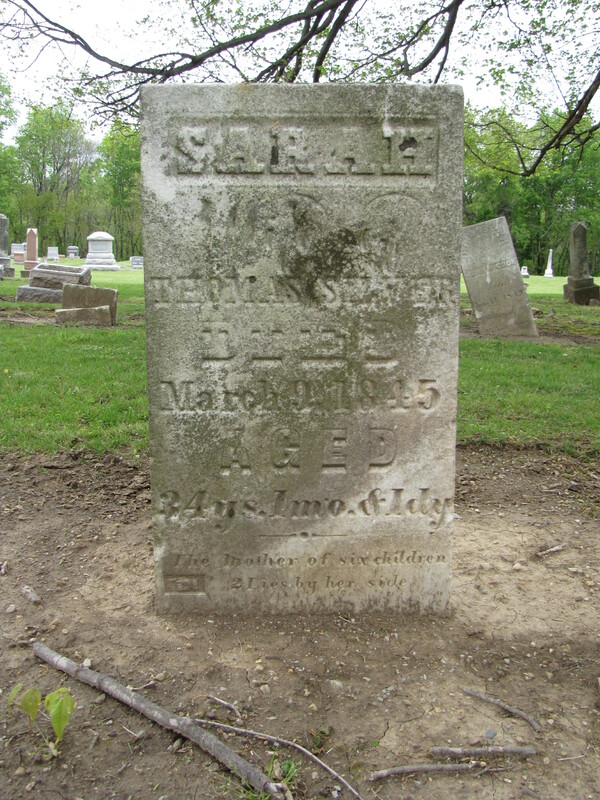 The young mother on this gravestone, Sarah, was only 34 years old when she died on March 9, 1845, and she had already given birth to 6 children! 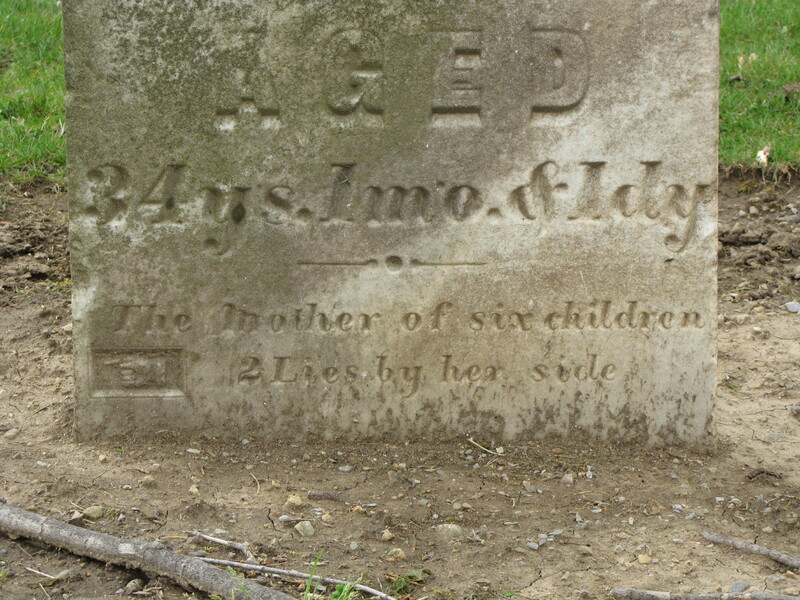 Her epitaph reads: The mother of six children, 2 lies by her side. The epitaph gives a hint about the dangers of not only giving birth but of the newly born. Each one of her births increased the statistical likelihood that she would die in childbirth. While we celebrate Mother’s Day this weekend, it is good to remember the sacrifices made by our mothers and the risks they took to bring us into the world. This kind of historical information is necessary today in a political world trying to strip women of control of their reproductive choices. Do we really want to return to such a dangerous state? I grew up in a Catholic environment where families in the 40’s and 50’s were large and all of us knew mothers who had died in childbirth. These were not “the good old days” some think they were. Many politicians would be better served by more historical data and less nostalgia. Having been a nurse for 30 years, I’m used to terms like taphophile , and it’s bguorht me some comfort to know that others like to do what I do. I am a taphophile, but what I do is go for a visit as my Oma taught me so many years ago. Now I’ve found you! Most don’t understand that I wasn’t upset when I couldn’t check into the little inn in Provence for my French cooking class .I’d seen a cemetery down the road that I could visit (and I’m a better cemetery visitor than I am cook). I risked arrest in a small town in Sicily by climbing over the fence (it was supposed to be open!). Finally my interest in art, history, and world religion has come together. The cemetery at St. Joseph Catholic Church in Jasper, IN has many cast iron grave makrers that looked like crosses with curly-cues on the ends. Have you seen these before? Do you know what they signify?